Glass and crystals combine to create a stunning stairwell chandelier. 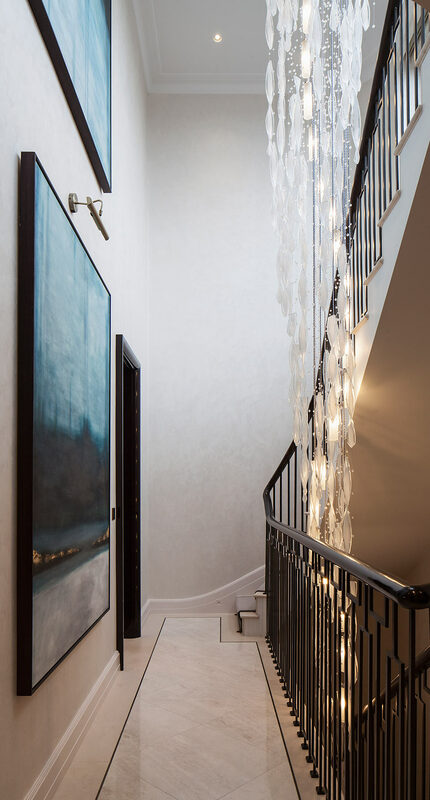 A dramatic yet elegant chandelier was needed for the narrow three-storey stairwell of this high-end London apartment. Working closely with the interior designer we were commissioned to create a focal light sculpture that would command attention, while allowing daylight from the skylight above to filter through. The handcrafted seven-metre chandelier is suspended from a precision engineered, polished nickel structure positioned directly below the elliptical skylight. The frame is purposely simple and “open” in design to make sure the flow of natural light is not restricted. 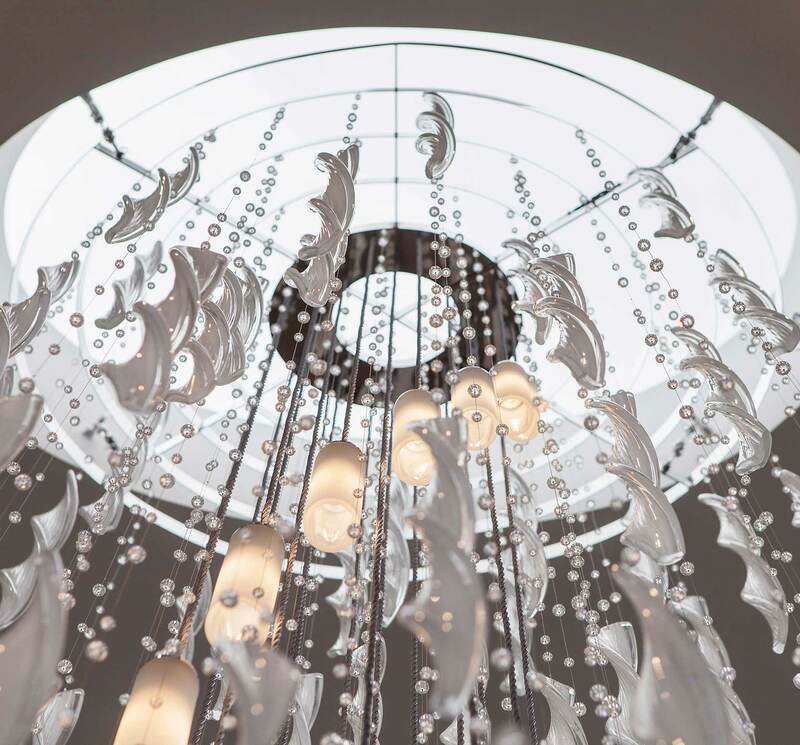 The impressive lighting installation comprises over 100 handmade Italian glass twists and 1500 faceted crystal spheres. The glass twists have a rippled texture, an opaque centre and a pointed tip for added definition, and they complement the crystal droplets beautifully. Cascading through the centre is a spiral of 22 frosted glass lanterns housing LED lamps, which provide a soft, warm glow of light to the space, while highlighting the sculpture’s intricate glass work and sparkling crystals. 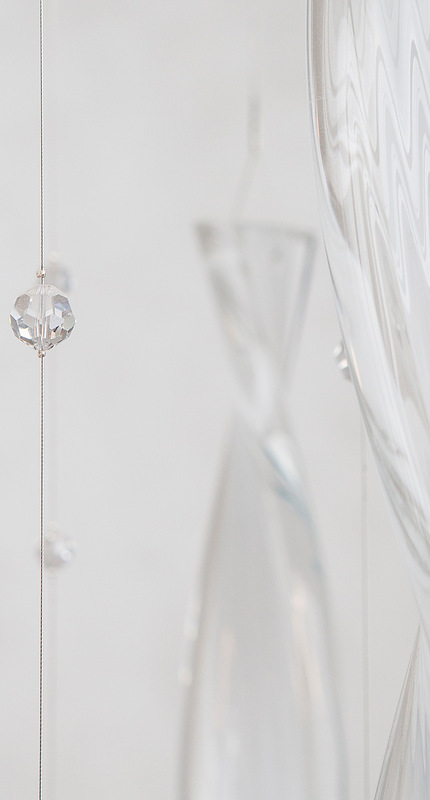 Throughout the design, manufacture and installation every detail was diligently considered – from the positioning of each individual element in the design stage to the threading and fastening of every tiny crystal.